Time limits apply to standard sprinkler systems with spray heads. If you are using outdated spray heads for your irrigation, your existing landscape may not survive this limited amount of water. NOTE: The 5-minutes-per-day time limit does NOT apply to landscape irrigation systems using water-efficient devices, including drip and micro-irrigation systems and stream rotor sprinklers. All our landscapes utilize low water irrigation methods and are therefore not governed by these rules. The terms water-wise, drought tolerant, dry garden, xeriscape, zeroscape, and sustainable landscape, all refer to varying approaches used for creating SUSTAINABLE LANDSCAPES. A sustainable landscape is one that uses less chemicals and water, uses plants suited to the site climate, and generally increases habitat for vital wildlife like birds and bees. 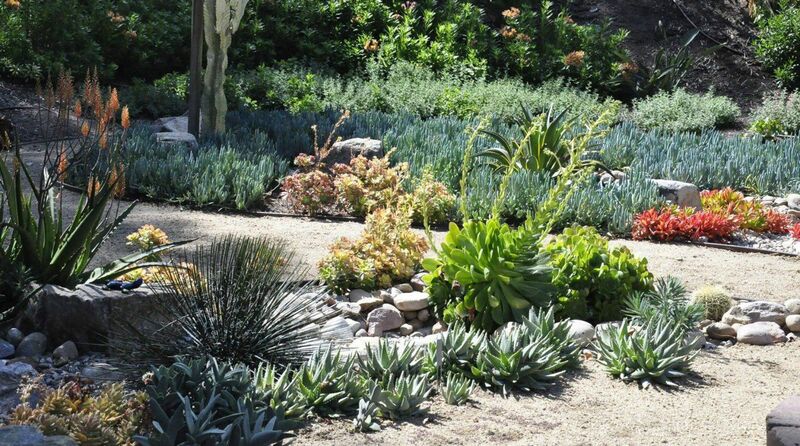 Xeriscaping does not mean zero landscaping where there is only rock, gravel, or dirt. A sustainable landscape can be full of color, change with the seasons, and offer a source of relaxation and connection to nature for the homeowner. As is evident from our portfolio, a sustainable landscape can be designed in any style. On January 7th, 2015, Governor Edmund G. Brown Jr. proclaimed a State of Emergency and directed state officials to take all necessary actions to prepare for drought conditions. “I’ve declared this emergency and I’m calling all Californians to conserve water in every way possible.” With this proclamation the Governor brought National attention to a new reality: water is a precious commodity. s and businesses to voluntarily reduce water consumption by 20 percent. According to KQED news, the California Single-Family Water Use Efficiency Study of California single-family water consumption estimated that the average California household used more than 360 gallons of water per day. To put that in perspective, the typical office water cooler holds 5 gallons, or about 1.4 percent of the study’s estimated daily average household use. Given that figure, the average household in California would need to use 72 fewer gallons a day to meet the 20 percent reduction goal. The study found that about 53 percent of total average household water use — or more than 190 gallons per household per day — was used for landscaping and other outdoor uses. Because the landscape around a home consumes such a large amount of residential water, a sustainable landscape provides a great opportunity for savings. Our design process takes into account the climatic conditions of the site, existing vegetation, topographical conditions (slope, soils, paved areas, etc. ), the intended use and desires of the homeowner, and groups plants by water needs (sometimes referred to as "Hydrozoning"). We also allow for landscaping to be done in phases. Turfgrasses, or lawns, are a very practical surface for urban landscapes. However, turf is often used where the function isn’t recreation. In these situations, we use more water conserving plant materials. Reducing the amount of turf can result in a significant reduction in water use. Furthermore, when we do specify turf, we use Medallion Dwarf Fescue with Bonsai by Pacific Sod. Lawns planted withMedallion Dwarf with Bonsai are more durable, darker green and require less water, fertilizer and mowing. We use exclusively use low water drip irrigation in our landscapes. Using drip irrigation places the water at the root zone where plants need it. Timers are set to water deeply to encourage deeper root growth, resulting in a healthier and more drought tolerant landscape. For areas with turf, we use Hunter's MP Rotors which are rated in gallons per hour as opposed to traditional spray heads which are rated in gallons per minute. The most basic component of your landscape is the soil. Properly preparing the soil before the landscape is installed will assure the success of plants. We amend soil with compost. Compost improves the aeration and drainage of heavy clay soils, improves the water-holding capacity of sandy soils, and increases the ability of all soils to retain nutrients. Mulch covers the soil and prevents crusting, compaction, and water evaporation. In fact, mulching around trees, shrubs, and in flower beds can result in a ten-fold reduction in evaporative water loss from soil. We recommend shredded bark mulch made from the bark of redwood and Douglas fir trees because it tends to last longer and stay in place better than other mulches. For most people, plant selection is a fun part of the design process. Selecting the right plant for the right place is essential for creating a water-efficient landscape. John is a botanist who is well-versed in temperate, desert and tropical plant communities. You can trust that we will plant the best plants for your location, soil type, and climate. A benefit of established water-wise landscapes is they require less time and money to maintain than a traditional landscape. In such a landscape, you will spend less time trying to manipulate plants to fit your conditions, and more time enjoying their beauty. The main activities of water-wise landscape maintenance are irrigation and irrigation system maintenance, weed control, fertilization, pruning, and pest and disease control. Keep in mind that newly planted landscapes will require much more “upfront” maintenance, especially regarding weed control, and that all landscapes require some maintenance, whether they are water-wise or not. With persistence and patience, your water-wise garden will become more self-sustaining and require much less of your time. On January 7th, 2015, Governor Edmund G. Brown Jr. proclaimed a State of Emergency and directed state officials to take all necessary actions to prepare for drought conditions. “We can’t make it rain, but we can be much better prepared for the terrible consequences that California’s drought now threatens, including dramatically less water for our farms and communities and increased fires in both urban and rural areas,” said Governor Brown. “I’ve declared this emergency and I’m calling all Californians to conserve water in every way possible.” With this proclamation the Governor brought National attention to a new reality: water is a precious commodity. However, the idea of conserving water in the landscape is not new. In 1981, Nancy Leavitt, of the Denver Water Board, coined the term "xeriscape" by combining the Greek word "xeros" meaning dry, with the word "landscape." Another staff member, Bob Fletcher, created the xeriscape logo. The Xeriscape Task Force, as it was then known, adopted the new term "xeriscape" and its seven fundamentals of xeriscapes: planning and design, soil improvement, reducing turf, mulching, efficient irrigation, low-water use plants, and regular maintenance. To celebrate and promote these new ideas, On May 8, 1982, during "Water for Americans" week, they hosted an "X-rated Garden Party" at the first xeriscape demonstration garden and education program, dedicated to the citizens of Denver. SoCal Water$mart rebates are available for $2.00 or more per square foot of turf removed. This increased turf removal rebate is being provided in response to Governor Edmund G Brown Jr.’s emergency drought declaration. In addition, The SoCal Water$mart rebate program for residential water customers issues rebates on a first-come, first-served basis until funding is exhausted. The Turf Removal Program has re-launched with new terms and conditions, effective for all applications submitted after 1:00 p.m. on May 12, 2015. Residential turf removal customers may now apply and receive $2 per square foot, up to a maximum of $6,000 per property. Residential customers who previously received a turf removal rebate may apply for a rebate for additional areas. However, each property is subject to a maximum of $6,000 for all past and current turf removal rebate requests combined. NOTE: Artificial or synthetic turf (or other turf-looking grasses) and invasive species-type plants are not eligible. The existing landscaped turf area to be replaced must meet the following requirements. Residential sites: Minimum 400 square feet to maximum 2,000 square feet. Commercial, industrial, or institutional sites: Minimum 1,000 square feet to maximum 6,000 square feet. Everything you need to know about obtaining a rebate from The San Diego County Water Authority. A selection of great low-water use plants with pictures in a handy chart you can carry to a nursery. This web site is a collection of tips on saving water, education for children, rebates, events, contacts, information on droughts, classes, and other resources. There is nothing like going to see plants in an established landscape. One of the biggest mistakes people make is to plant cute little plants they find at the nursery without knowing how large those plants will grow. Often, those cute little plants grow to be giants. By visiting a mature garden, you will have a much better chance at choosing the right plant for the right place.